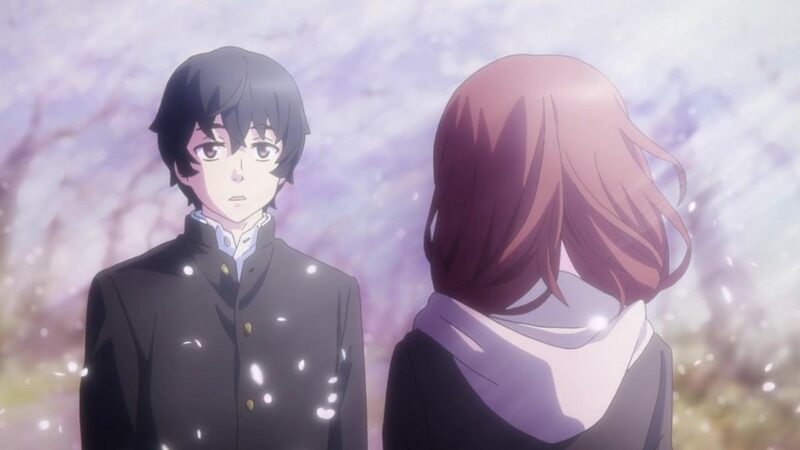 Hello, Before we start with Just Because I wanna mention my Romeo x Juliet review that i did last time, if you are interested in the anime you can check it out.Just because is a anime that came out in 2017 on 5 october. It’s made by Studio Pine Jam it has the tags Romance, School, Drama and Slice of Life. Just because is an anime with a lot of different characters with each their own stories. while also intertwined with each other. Every character has his/her own problems but also their emotions. The first character i wanna talk about is Izumi Eita, Izumi transferred back to his old school in the last semester of the third year. Izumi is the friend of the second person i want to introduce. The second person is Souma haruto. Souma the carefree guy who doesn’t have to worry about entrance exams because he will work after graduation. The third person is Mio Natsume. Mio is busy everyday with entrance exams and is in love with Souma but Souma doesn’t feel the same way. But later we will see that her feelings change. The fourth and final last character is Morikawa Hazuki, Morika Hazuki is busy with her life. Preparing to go to a school far away and closing everything off at the school and finishing the last couple of weeks. The final character is a bit of an odd one out of the five her name is Komiya Ena. Komiya is the only one who is in the second year of Highschool and fights just to save her photography club but she wants to use Izumi’s photo. This anime is about the 5 character in a coming to age story all riding the train to adulthood. While also experiencing the troubles with entrance exams, studying and people moving away. To make matters worse they also fall in love a want to confess before their true love moves away. But confessing is not this simple and the stories of these five people will intertwine. Will we see the perfect love story or will we end up seeing only disaster? The group at the start is Izumi, Souma, Morikawa and Natsume. They hang out which each other by going to the aquarium and talking to each other and just having fun. The days before graduation are filled with studying, having fun and later worrying about love. These four have no real connection between them. But Izumi’s return to the hometown and the same school makes the group one. Izumi and Souma are friends and because Souma is in love with Morikawa they hang out with each other. But Natsume is in love with Souma she wants to be with them also. That’s how they become a group which shares and does things together. Then we got Komiya, Komiya we see also in the beginning but why we find out later. Komiya wants to restore the photography to the old glory. But she can only do that by winning a contest and she wants to use the picture of Izumi. She hangs around him constantly because she wants to use his picture but Izumi keeps refusing. But in the end he lets her use it. The problem is while she was hanging around him she fell in love with Izumi. So now we got five people who all fell in love but not one couple. Long-forgotten memories, deeply buried emotions, and inspiring new passions everything is brought to light in their bittersweet final semester. The romance of Just Because is really simple. Izumi who came back to the same highschool was always in love with Mio and still is . Mio is in love with Souma but Souma doesn’t feel the same way about her. Souma is in love with Morikawa. Morikawa is in love with Souma but she can’t be in a relationship with him because she is gonna move for college. Souma wont take no for an answer and goes to amazing lengths to make her say yes. The romance between Mio and Souma is quickly changing because Mio start to notice that she has feelings for Izumi. But on his return they don’t really have anything so it takes a while till their story takes off. In the meanwhile Izumi and Komiya are spending a lot of time together and Mio doesn’t like this. The final episodes in the ending will leave you like everything will end wrong. Izumi and Komiya will never work out because Izumi is not in love with him. Mio and Izumi will also not happen because Mio tries to hide her feelings and tries to focus on her entrance exams. I will start by telling what happens with Souma and Morikawa and than the others. Souma who kept chasing Morikawa in the ends still gets a no. The reason that she is far away they. They also can’t come to see each other because a ticket cost 30.000 yen. They can’t afford that. But not all is lost. Morikawa loves Souma and says to him that when she is done with college she will come to him. And if he still loves her she will begin a relationship with him. The ending doesn’t show us the ending with them together. but it implies in more ways than one that they will get together. The ending between Izumi, Komiya and Mio is a bit more complicated. Komiya and Mio are rivals and while they don’t clash often. There is one moment in the episodes where you see Mio stand up and shows she loves Izumi. Komiya ask Mio for permission to ask Izumi on a date. Mio responds with a solid “no, you may not.” While there not in relationship. But Komiya obviously does not listen. In that time Mio is busy with her entrance exam. Izumi’ tries to help Mio where he can. Komiya who still tries to convince Izumi to use his picture in the end he gives in. Komiya says she will confess she loves him after the photo wins. she says this in a special way. I will confess my love to you if my photo wins! So she did confess her love to him but he cannot reply because she needs to win or lose the photo competition. in the end she got the trophy but a different photo won. The photo that won was the photo someone took of her while she was taking the photo of Izumi. But Izumi anwser her that he can’t be with her because he is in love with someone else for a long time. Aka he loves Mio. Now we only got Mio and Izumi left. While Izumi was already accepted into Joei he tries to get intot he college which he knows what Mio’s first choice is. Mio recently changed her first choice into Joei and she passes the exams for that and gets into Joei. Izumi did not pass his exams for the former first choice college of Mio and goes to Joei. While Izumi does not know Mio is there, Mio knows about him being there. before they went to college Mio send him a message to meet him but he was late on the place and they missed each other. He send her a message he was late. she didn’t message him back for a month. in the last couple of minutes of the series we see Mio sending him a message and after a bit of talking says to him. “Turn around.” He sees Mio standing behind him. Now in the end we do not see a kiss but we see them walking to each other. I rate this serie a 8 out of 10. The graphics of the anime fit in nicely with theme and gives it a really good feeling. Every scene they do feels like it fits nice and not one scene feels out of place. The whole series i had the feeling the creators handled with care to make it to what it is now. The best thing of this anime is that is not your normal Slice of Life school anime, it is realistic and feels not fake . My anime list gives this anime a 7.55 which is a bit lower than what i scored it. Good review,thanks for the information,I’ll put it on my bookmark list,since I’m a romance sucker to the core. Although,I have one question,are the characters enjoyable,in your opinion? The charcaters are very diverse which makes them all different. I think all of them are enjoyable but my favorite character is Mio. But some people don’t like Mio because then thing between Mio, Koyima and Izumi. If you remember other romance anime with fighting over the ship with 0 concern for the anime that is why people don’t like Mio. But for me it’s more Mio is really a deep character. for the other characters they’re well fleshed out and have a good consistency and they are not bland. I see,I’ll look forward to each character then,despise the hate on them. I only watched watched the first episode of Just Because. Now it’s time to watch the rest. Pingback: Winter 2018 Anime have caught my attention, wanna know why?